While it bears the name of their martyr, the stadium serves more as a reflection of peace and harmony now sustaining in Rode despite its once-violent history. 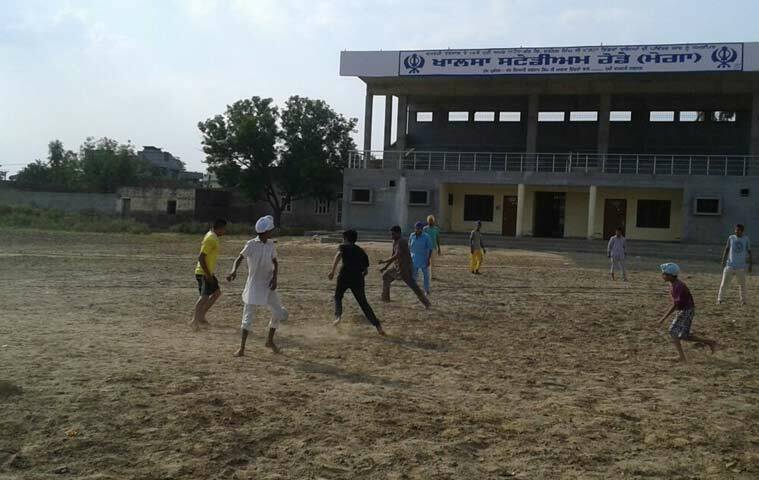 Children playing in the stadium named after Jarnail Singh Bhindranwale in Rode, Moga. While tensions owing to the 31st anniversary of Operation Bluestar continue in Jammu, Ludhiana and Amritsar on Saturday, there is not a single policeman posted in the village of the man at the heart of the incident, Jarnail Singh Bhindranwale at Rode in Moga district of Punjab. Thirty years since the unfortunate event, villagers are still keeping Bhindranwale’s memory alive. While they mark his birth anniversary, February 12 with an annual sports tournament, on the Bluestar anniversary, they hold langars/chabeels (water and food stalls). “No police get deployed here because we know how to respect our village martyr peacefully. The trophies which are distributed to the winners for the tournament held on his birth anniversary bear his photographs,” says Jagtar Singh, the nephew of Bhindranwale. ‘Khalsa Stadium – in pious memory of the 14th head of Damdami Taksal martyr Jarnail Singh Bhindrawale’ — a plaque outside the stadium where the annual affair is hosted reads. Villagers say they couldn’t have asked for a better venue. “Why do we need security? All villagers remember him in peace. His three brothers live here and we are like family. Children play sports in stadium created in his memory,” says Satinder Singh, a Rode residents, as he watches a group of teens get ready for their volleyball match on Friday evening. Besides them, there are girls getting coached in kabaddi, learning the ‘gatka’ (martial art) and self-defense. At the far end, a group of school-going children have come for wrestling and kabaddi matches. The Damdami Taksal and NRIs in the village had come together to convert a pond into the stadium. “Initially we spent Rs 10 lakh in filling the pond with soil in 2008. The initial amount was spent by NRIs and the Damdami Taksal. The SAD government then pitched in. Now, the estimate of this stadium is Rs 1.17 crore. Around Rs 52 lakh has already been spent after deputy CM Sukhbir Badal visited here three years ago. We are expanding the stadium as funds are coming and matches of next Kabaddi World Cup might be held here,” says Laxman Singh, the village sarpanch. The villagers have also found other ways to remember him. There is a gurudwara in his honour while plans are afoot for a girl’s college in his memory. NRIs are now helping in installing doors at the newly-constructed gurudwara.